Time to welcome you all to another wonderful Endless Summer Project from the team of hyper-cool moms: Melissa, Alexandra, Jen, and me If you stepped into the vast wormhole of the internet last week and missed Alexandra's hopping backyard BBQ, you missed a safe alternative to horseshoes, a great grilling recipe, and an adult beverage to adore. Skip on over and enjoy... and then come right back. Or maybe go check out Melissa's cute mosaic stepping stones first. And THEN return, bright-eyed and bushy-talled to check out our Rings of Color Sharpie Dyed Shirts!! Last summer we did a great tie dye shirt project together, and my children loved crafting and wearing their shirts. To kick off our summer together, I wanted to make another wearable piece, and what could be better than an excuse to use Sharpie markers? This project is totally inspired by the great Martha Stewart (I'm hoping we'll be BFFs after next week). To see a helpful video on how to, go here. We took our project to the backyard for more summertime fun, but this craft is safe enough to do in a clear spot inside for a foolproof rainy day creation, too! Neon is all over the place this summer so we chose new NEON Sharpies. Their saturation was a great choice for the brilliance in color palette. Step One: Insert a clean cookie sheet into the t-shirt. This will prevent the alcohol and markers from bleeding through to the back of the shirt. Step Two: Visualize your design (or not). My girls and I decided we wanted to created a strip of colors that ran down just one side of the shirt so we planned out where we wanted the circular shapes to go. If you're more into free form, you can set up one circle at a time and add as your fancy desires. Step Three: Insert the circle object underneath the top layer of the shirt. Secure its placement with a rubber band. Step Four: Draw thicker dots with Sharpies in a ring pattern. Step Five: The fun!! Fill an eye dropper with isopropyl alcohol. Squeeze out one drop at a time and watch the colors slowly bleed. Try different effect for dropping it inside the circle where no color is and dropping it right onto the dots themselves. To keep your colors more brilliant, limit your drops of alcohol. To spread your circles the most, keep adding drops. Step Six: If you don't want the rings to bleed into one another, be sure to wait until the alcohol has mostly dried before moving on OR spread out the rings so that they do not overlap. Step Seven: Allow the alcohol to dry (mostly) and flip to the other side to create more patterns and fun! Once the alcohol has dried completely on both sides, remove from cookie sheet. Pop in the dryer for 5-10 minutes (on its own) to set colors. Step Eight: Wear to your heart's desire! Colors should now be set within the fibers but I'd still recommend washing with like tones on the first machine wash.
Fair warning here, friends: fun projects like this might ensue a whole lot of sillyness and laughter so be prepared to make great summer memories. So grab your Sharpies, friends, and get creating!! 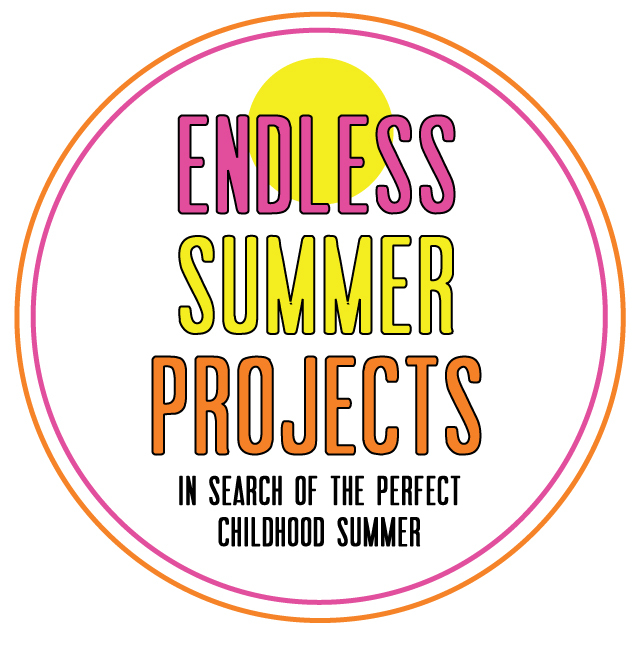 We'd love to see your creations - share them with us using the hashtag #endlesssummerprojects and look for sneak peeks of Jen's fabulous project for next week! Here's to an endless summer of childhood fun.